A co-worker received his Amazon.com order and inside the box was a Vonage promotional flyer. Great to see Vonage expanding beyond just Internet advertising and their "woo hoo" TV commercials. Of course, one has to wonder how much Vonage is spending to acquire each customer. I also have to wonder why they would target the Amazon.com demographic, which consists mostly of online savvy folks, which no doubt have already seen Vonage banner ads already. Wouldn't Vonage would be better off doing local mailings to target a broader audience? There is a huge demographic of broadband users that only use the Internet for email -- for staying in touch with friends/family and only some occasional surfing. Many parents, or those >45 years old fall into this category. A banner ad won't work on these people, since they don't surf enough, nor are they tech-savvy enough to realize the savings VoIP could bring them. So wouldn't it make sense to send a paper flyer to these folks that explains in layman terms how Vonage works and how much money could be saved? For these types of folks, I think you can do this with much more effectiveness using a paper promo flyer than a banner ad, especially considering web surfers are 1-click away from leaving a site. The temptation to read a few sentences online and then leave the site is much greater than throwing away paper marketing flyers received in the mail before you read the marketing message. Sure, we all get a lot of paper junk mail as well, but if you use a postcard-type mailer, you don't have to open an envelope, and you can the words "free" or "flat-rate calling for $24.99", which would entice many users paying >$50/month on their phone bill. In addition to Vonage spending a ton of money acquiring customers, there is also the issue of Vonage begging customers to stay. In fact, when I finally cancelled Vonage yesterday (I was call-forwarding Vonage number to new number), the Vonage customer rep didn't 'beg me', but rather tried to come up with any excuse she could come up to blame my ISP for my QoS issues, blame me for not contacting their technical support team to try and resolve the issue, as well as try and get me to stay with Vonage. I felt like I was a child being berated for not telling my parents that I was having trouble with some bully at school. It's an interesting phone call, which as luck would have it, I recorded the call. (There was no luck involved, I anticipated Vonage giving me a hard time trying to dump them, so I planned on recording it. ) I hope to transcribe the call and attach the actually MP3 recording of the call later today. So stay tuned! Great stuff! In the meantime, here's a webcam grab of the Vonage/Amazon promotion. Anyone else see these promo flyers? A co-worker received his Amazon.com order and inside the box was a Vonage promotional flyer. Great to see Vonage expanding beyond just Internet advertising and their "woo hoo" TV commercials. Of course, one has to wonder how much Vonage is spending to acquire each customer. I also have to wonder why they would target the Amazon.com demographic, which consists mostly of online savvy folks, which no doubt have already seen Vonage banner ads already. 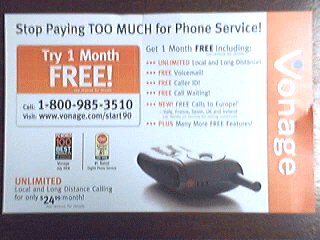 Wouldn't Vonage would be better off doing local mailings to target a broader audience? There is a huge demographic of broadband users that only use the Internet for email -- for staying in touch with friends/family and only some occasional surfing. Many parents, or those >45 years old fall into this category. A banner ad won't work on these people, since they don't surf enough, nor are they tech-savvy enough to realize the savings VoIP could bring them. So wouldn't it make sense to send a paper flyer to these folks that explains in layman terms how Vonage works and how much money could be saved? For these types of folks, I think you can do this with much more effectiveness using a paper promo flyer than a banner ad, especially considering web surfers are 1-click away from leaving a site. The temptation to read a few sentences online and then leave the site is much greater than throwing away paper marketing flyers received in the mail before you read the marketing message. Sure, we all get a lot of paper junk mail as well, but if you use a postcard-type mailer, you don't have to open an envelope, and you can the words "free" or "flat-rate calling for \$24.99", which would entice many users paying >\$50/month on their phone bill.